These really cool animals grow up to 45 cm long. Also known as spiny anteaters, short-beaked echidnas use their snouts and long tongues to catch ants, termites, spiders, worms and other invertebrates. Their sharp spines give them excellent protection against predators. When threatened, they use their powerful claws to quickly dig into the ground with only their spines showing for the predators to deal with. The three species of echidna and the platypus are the only species of egg-laying mammals in the world, making a family called monotremes. At breeding times, the males form a long train as they follow the females around waiting for a chance to mate. The female then lays a single egg in her pouch and she raises the baby alone. Baby echidnas are called puggles. Short-beaked echidnas are found in a range of habitats throughout Australia and New Guinea. They are quite common throughout most of their range, although they are often run over by cars. 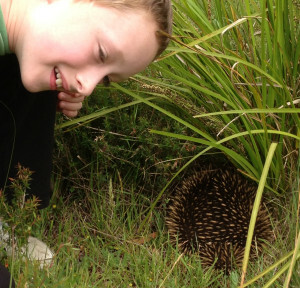 Are there any other interesting facts that you would like to share about short-beaked echidnas? As a young teacher in the early 1960s I was appointed to Wellington NSW and while out shooting feral goats we observed an adult echidna with 5 (five) puggles in a train behind her. They were far too small (about 5 to 6 cm long) to be randy males. This was at a time when we were taught that the eggs were laid and the young hatches and were self sufficient (like turtles). I only discovered your blog today. Best wishes.